It’s a huge combination of awe and culture shock. I feel like a goldfish that flipped itself out of a bowl. I was having an intensely hard time with things last week. I’d taken Jane to Central Park, gotten lost, taken her to the wrong playground, she got kicked in the eye, and then I didn’t have the cash to buy her the ice cream I promised and she cried her eyes out. I missed my family. I missed my friends. I missed chocolate gravy, even though I rarely ate it in the first place, but still. I missed knowing I could get it if I wanted to. Same goes for grits. Never eat them. Now all of a sudden I want to make them my mascot. It makes no sense. I find myself saying “ya’ll” just for spite, like, I feel aggressively southern about it. So I went up on the roof deck to get some air one night. It was windy, and the entire city of Manhattan was just across the water, sparkling and beautiful and almost breathing like this giant living thing, and I started crying. It was weird, to be in awe of being in a place and also simultaneously homesick. But the weirdest part was the fact there were people up on the roof, a small group of them, clustered over in the corner having some wine. They looked up at me, “hey there’s a crying girl” expressions on their faces, and immediately went back to talking with each other. That was the weirdest part of living here so far. Because on one hand I was happy to be ignored. I was happy for the anonymity of sitting in a deck chair with my knees under my chin without having a stranger get all up in my grill to help. But on the other hand, it also made the home sickness a little worse. Because in the south? You cry in public with mascara running down your face like an accidental Alice Cooper and someone is getting up in your grill with a “honey, are you okay?” whether you like it OR NOT. There’s a park that Jane loves. We walked there on a very hot afternoon. I hadn’t packed a thing for her to get wet in, and we had no flip flops or towel. 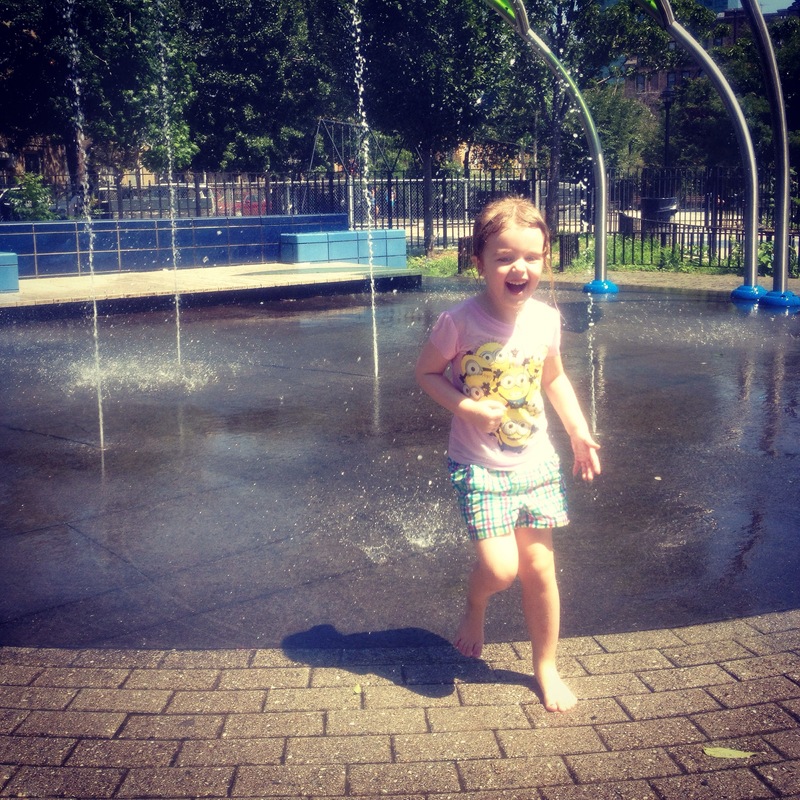 But I took her shoes off and said, “Go for it.” And I sat there on the park bench, watching that beautiful girl dart in and out of the spraying water, fully clothed in her shorts and Minion t-shirt, and it was good. Very good. The red brick apartment buildings rose up around us, and there were bees buzzing around the sunflowers, and she ended up walking home in completely soaked clothes, so happy. Then when we got home she waved at the door man (who she knows by name and has to stop to talk to every time) and told him all about the “playing in the water in New York.” And she stood there dripping all over the floor of the lobby while he smiled and listened and responded with the appropriate “oohs and ahhs”, every now and then glancing up at me to smile too. It was a good moment. Our doorman is good people. Over the weekend the three of us tackled Costco and Ikea and Micheal’s and a regular grocery store (where we parked on the roof). This all happened with no deaths or arguments, so basically a huge family victory. I have dreamed of having an Ikea close by my entire adult life, but now that I have it I’ve learned a very important lesson. You better seriously hydrate with some Gatorade beforehand. Maybe pack some protein bars. At a certain point I very nearly curled up on the bed in their 250 square foot apartment set up. Fayez’s eyes glazed over. Jane took advantage of our mental state and seized the opportunity to talk him into buying her yet another stuffed dog. Her room is turning into a stuffed pet kennel. Fayez and I have unpacked and organized and unpacked and organized again. Our apartment is looking more apartmenty rather than a storage unit. 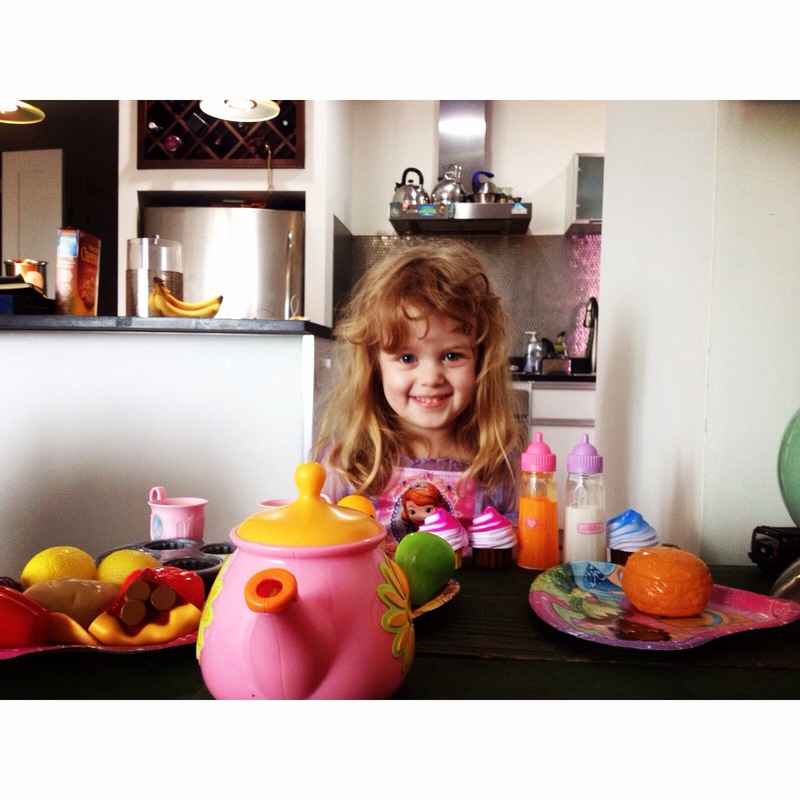 In the picture of Jane above, you can see three tea pots on top of the vent hood in the kitchen. That sort of sums up what combining two households is like. There are double and triples of everything, and deciding what to get rid of and what to keep gets all Sophie’s Choice at times. But. We have a big kitchen with regular appliances (for NY standards). We have two bathrooms. We converted a small entry closet into a legit pantry (thanks Ikea). My lamps made it safely and there are curtains. And ya’ll know how I feel about my curtains and lamps. Yesterday we went to Dylan’s Candy Bar. We got ice cream upstairs, and sat next to a British couple who both had blue hair, and Jane thoroughly approved. She told the waiter “I want blue ice cream” and then pointed to their heads. They smiled at her. Then we made it back onto the subway and to Macy’s on 34th street (thanks to Fayez’s text-instructions, so much better than Google maps). It wasn’t Gimbles, but I was still having all kinds of Natalie-Woods-classic-movie-love feelings, and they still have the vintage wooden escalators. I was simultaneously charmed and suspicious of their safety ratings. No, I read it all! I enjoyed every bit. This is so fun to see Jane exploring New York, a little bit of a latter-day Eloise! I totally get it about the grits. I lived in Denver two years after a nasty divorce, and all I wanted was grits and bacon and chocolate cake. It seemed that no one ate those things there. Oh my sweet friend, I read this all and I FEEL YA. I am always caught in those moments where I want someone to help and there isn’t anyone because this is NYC, or I do not at all want anyone to help and yet I still wish I lived in a place where someone wasn’t asking me what I want but just helping because that’s what humans do. What an adventure. I understand the mixed emotions of awe and fear and sadness. I’ve been there. Sometimes, I am still there. But, good for you! Taking on the challenges and facing them head on. Thanks for sharing these adventures with us!! I read every word, and loved it! It is so nice to hear about your adventure, and I just soaked it all in. I had a difficult time when I moved from the Midwest to Boston. I had never been entirely left alone by strangers before. But then I slowly realized that when they were interacting with me, it was more genuine. It was less ‘Have a nice day’ and more of a true interest. Not that I am slagging off the Midwest – I am living back here now, and it certainly has its charm. But I sometimes miss the atmosphere and culture of Boston. I hope you have a wonderful time exploring NYC, and that it starts to feel like home for you soon. 🙂 Much love to all three of you! We moved from Wisconsin to Nashville a year ago. I had always been enamored of the South, and was really excited about moving here, but it has been the hardest, hardest year. That’s not the point I wanted to make here though- the interesting thing I’ve found is that I’m clinging to my Midwestern roots. I’m researching lilacs that will survive down here, making Midwestern recipes, etc. It’s really interesting how this has surfaced, after years of just “ehhhing” Wisconsin. Now I’m like, “Wisconsin is the best place ever! Nobody should ever leave it!” My parents just sold their home (MY home) there, so I’m a total mess, but my point is: I feel the same way. There are no cheese curds to be had here. Boo. Oh goodness! When I did my one and only visit to NYC, I was so stinking lost the entire time! And I have good map reading skills! I just could never figure out where I was in relation to anything else. I ended up at Grand Central Station a lot, because when I was there, I knew where I was and could get where I was going. I looked for a grocery store while I was wandering. Never did see one. I have been endlessly curious as to how one shops for food in the city. For your next outing, I require pictures. These are the things that keep me up nights, wondering about. Do go explore the fashion district. The fabric stores there are just beyond anything I had ever experienced in my life! I spent five hours just stroking fabric! Homesick, I get. I was in the Army for a time and each time I moved, I had to go through all the same stuff. I would worry about where to live and if I could find home again if I left. Nothing would feel right and north was never in the direction I felt it should be. I do hope that the day you wake up and realize that you are home comes quickly for you. I read every word of your post and loved it. I wish the best for all three of you in your new life. I am sure NYC will feel like home in no time, after all, home is where the heart is and your heart is there with your daughter and your husband. Please post some wedding pictures soon! You are so wrong! I read and enjoyed it all! 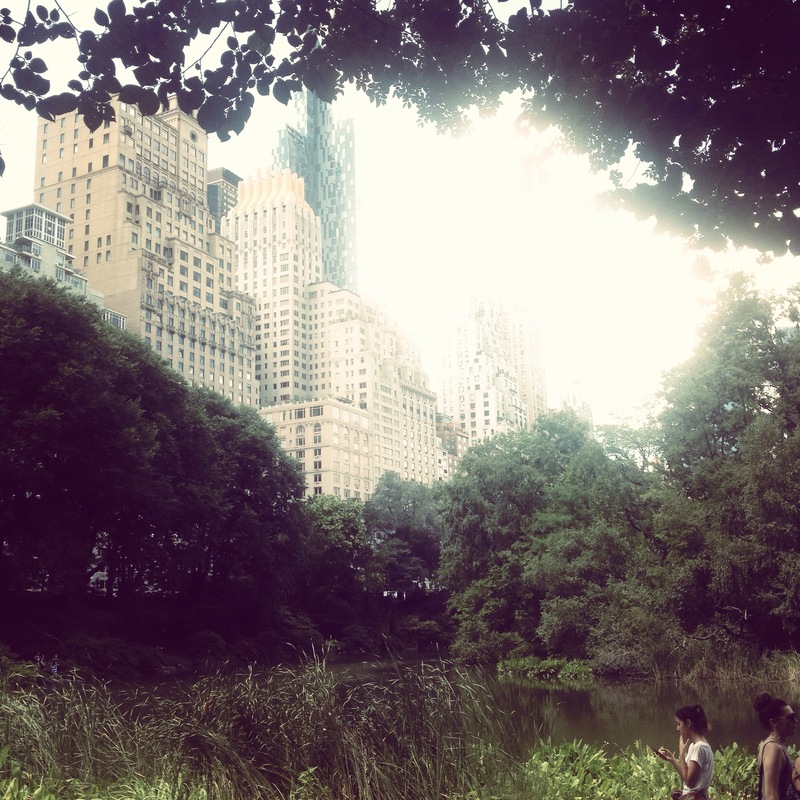 I am living vicariously through you right now, having never been to NYC. So you actually own a car in the city? Cool. IKEA may weaken you as a person. Cool…cool… You and your mini me almost makes me want my own mini me. Then I snap out of it! Haha! I may never be part of that universal mom’s club, but that Southerners Club? Y’all know I got that on lockdown! I read it all the way through, utterly enchanted,and wanted more! That child is precious. And you were given the gift of story telling. It’s okay to break down and have a good cry once in awhile. You’re a strong woman, but you’re also one going through a MAJOR life change and when that happens, it’s hard to keep a lid on your emotions. Let it out and move on. From a purely voyeiristic side, I’m loving these posts of your first few days in NYC because it’s an amazing thing to live in NYC and something that I’m sure many of your readers – myself included – have sat and wondered what it would be like to take on a place that large, that iconic. And you’re doing it. Of all the things you will REALLY miss it is the FOOD. I wanted my home town food when I was living overseas and crave the exotics now that I am home…:) At least you can MAKE your comfort foods, NYC stores have gotta stock the stuff like grits, don’t they? Jane will be lucky and grow up with a foot in both worlds! Read it all! Loved it all! Liz, you are amazing and resilient. I am in awe of your switch from Arkansas to New York. I live in NJ and the thought of living and driving in the city intimidate me. I wish you, Jane and Fayez all the best! Maybe you can think of adjustment to NY like adjusting to a new, huge college campus. Now that you’ve begun learning more about where things are, you’ll feel more comfortable. You sound like you’re doing great! As a “senior” member of the universal mom’s club I’m mandated to read your very long blog posts to the end (it’s in the charter). Every word was joy – thank you. I showed up and read it all the way to the end! There is a huge part of me that is so envious and excited by such a big change. New city, new life; not to mention the wonders of New York at your fingertips. How marvellous! 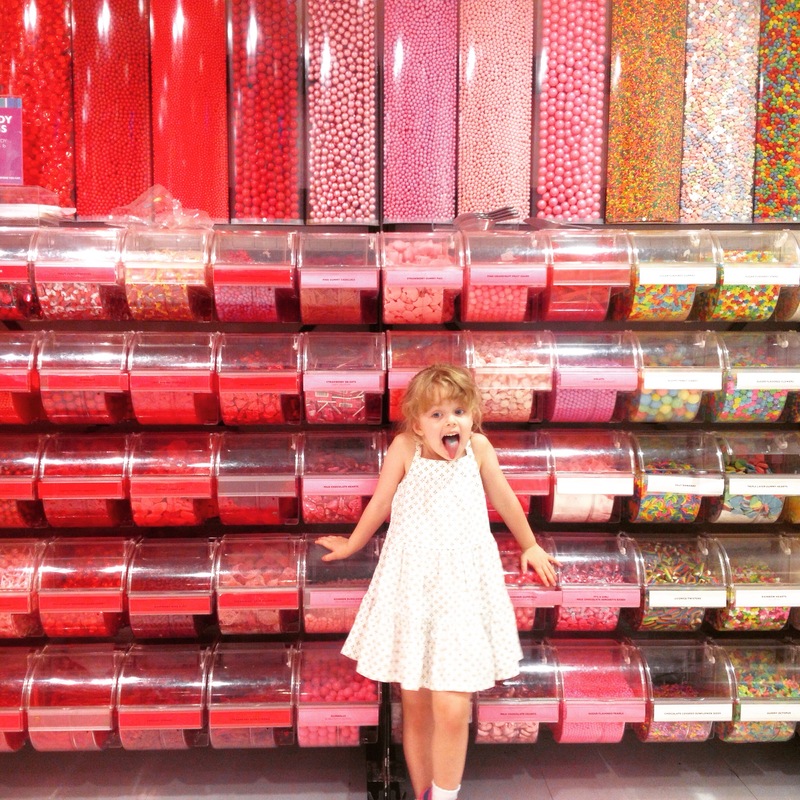 PS: Can I please come with you and Jane to that giant pink candy store?! Yum! Liz, it just wouldn’t be right if you didn’t feel a little homesick. One day you’ll be visiting “back home” and realize that NYC is your home now, and then feel homesick for New York! It’s overwhelming, that’s for sure, but take the Big Apple one bite at a time, and pretty soon, you’ll own it, baby! I hope your mom does not mind so many reading her post and thoroughly enjoying it and feeling your angst. Years and years and years ago, when I was 19, I got married and moved from Los Angeles to San Francisco. Culture shock. Moved back to Los Angeles then back to SF, got divorced and stayed. Moved back to Los Angeles after 13 years … THAT was a culture shock but my new husband was SO worth it. And after 26 years of marriage, a move to/from New Mexico (yes, another shock), I wouldn’t change a thing. I pray you won’t either. Find someplace to connect just for you. It will help. There are SO many good things to come for you and your family. I enjoyed reading every word. Wish the post was longer. I have never been to New York City and you are my tour guide. I am so happy for you. I READ IT ALL THE WAY THROUGH!!! 🙂 We made a positive move once upon a time from Phoenix Arizona to Portland Or. I wanted to move to Portland so bad I thought I would die before I got there. When I got there, I realized I had found my heart home. I still feel that way about Portland. Portland and I were made for each other. But the third day in, I called my son’s girlfriend crying like a dork and saying, “There’s too many white faces here! I miss Meeeexxxxiccaaannssss!” I still do because it’s still too dang white here. But yeah you get homesick but then one day you turn around and you realize you’re home. This will be me in 4 months, and I’m excited-terrified-desperately concerned about the lamp situation. And will be on a rampage for curtains. Lovely and honest post. You have to give yourself a chance…you just got there. It will take time. I have moved often and what I realized is that when you move “all of you” don’t arrive at once, only part of you arrive and then another part of you later and one day you’ll realize that all of you have finally arrived. I am French I don’t know if it makes sense the way I’m trying to explain it. It’s normal some of Liz is still at your other place. It takes time, be patient, enjoy, don’t worry, all will go well. So many things to do and see in New York and you have a new family life, this too calls for some adjustment. My first every comment to say Welcome Home. Your ‘voice’ sounds so alive again..it is wonderful and I am touched by it. I read it to the end–twice. I completely understand your compulsion to be so obviously southern. I grew up in Alabama and when we moved to Tampa (which is south by location, but not by culture) my accent got stronger, I listened to country music in the car and I loved shocking my coworkers, who were all from upstate New York with stories of growing up in Alabama (though I never exaggerated about the awesomeness of my Grandma’s cooking- that was all fact). I coped with my homesickness that way and understand what you mean. The good news is now I’m the southern belle with my friends here in Tampa who shares her grandmother’s thanksgiving recipes and knows how to send a handwritten thank you note. I hope the homesickness gets better. Looks like you’re making the most out of living in a pretty amazing city. So glad you and Jane are doing so well. Read the post top to bottom. Hang in there. I hope this gives you a laugh… I was born and raised in Connecticut. After college I took a trip to visit college friends who had relocated to Atlanta and Chattanooga TN. While they were at work I wandered around on my own. I almost developed whip lash because each time I was greeted entering a store I would spin around to see who they were talking to. The greetings were so big, so enthusiastic, that I kept assuming they were greeting someone familiar to them, not a stranger walking in a store for the first time. I really had a good laugh at my reaction. It really illustrated how reserved and standoffish people are in the tristate area can be. Have no fear. You will make connections in no time — especially with Jane leading the way. I can only imagine what an incredible adjustment it must be to move to NYC. You sound like you are handling it very well & taking each day step by step. Each day it will get easier. And sweet Jane is always there to make you smile.